Can members call the officers directly in an emergency? We don't offer direct calling to the DHP officers for the following reasons. The DHP officers don't patrol 24 hours a day. At current membership levels they patrol 8 hours per day. We don't want members to assume that they can reach a DHP officer instantly and call DHP before calling 911 in an emergency. Police departments have stressed to us that they want everyone to call 911 FIRST to ensure a rapid response for emergencies. 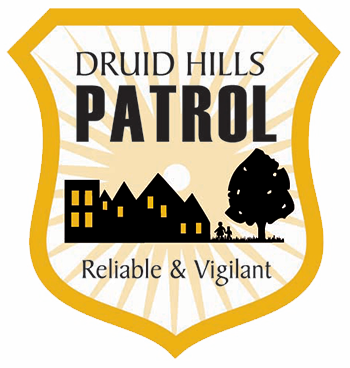 We encourage everyone to report incidents to the DHP after calling 911 so that we can monitor crime in the area. Our officers constantly monitor 911 dispatcher radio for both APD and DKPD when they are patrolling. When they hear calls for Druid Hills, they will respond immediately. Some members call to leave voicemails about administrative issues, and these calls would be distractions from patrolling. That is why all calls to the DHP phone number are forwarded as text messages to the Officer-in-Charge and the DHP officer phone. This allows the officer on duty to read text messages and respond only to emergency or crime-related messages. If a member doesn't leave contact information, the officer can search that information via our secure database. The messages are also sent to the DHP administrator email so that the board can monitor member communications.